"Care for some Darbucka or Oud to spice up your rhythms? Then look no further!" 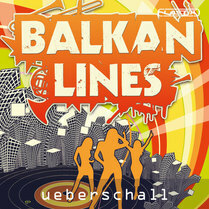 (...) Balkan sounds are seriously sought after sounds in today's industry. Gyspy orientated instruments are often heard in contemporary hip-hop, dance and leftfield electronics, but thus far there was no integral resource to extract those sounds from. Balkan Lines has been put together with the help of Superstar Orkestar (a celebrated Balkan brass band), and violinist Aref Shakouri. The package includes thousands of preset grooves, phrases and complex rhythmic blending spread across a large number of popular music genres. (...) With Balkan-inspired music rapidly climbing the charts, it was only a matter of time before a software package as such would be introduced. 365Mag thinks Ueberschall's right on the money with this package, as, at first sight, this tool offers a plethora of possibilities for your Balkan needs. Care for some Darbucka or Oud to spice up your rhythms? Then look no further!